Erik Karlsson and Victor Hedman are two of the most elite blueliners in the NHL today. While Hedman has enjoyed the benefits of being on one of the league’s most offensively-gifted squads, Karlsson has had a fairly tough season resulting in his current -24 rating. Despite the rough campaign, Karlsson was selected to represent Ottawa at the All-Star Game this weekend, so he flew down to Hedman’s stomping ground – Tampa Bay – and prepared for a weekend of fun. Hedman, who is currently sitting on injury reserve with a lower body injury, was named the official equipment manager of the Atlantic division. He got things started in the most flashy way possible by dressing up with his fellow Swedish blueliner. While it is certainly a funny costume, there is something inherently awkward about the video. 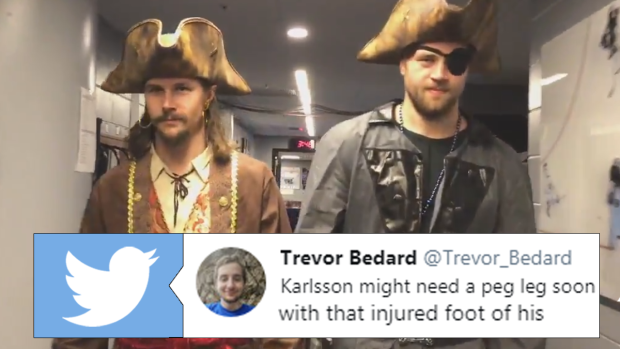 Maybe it’s that the Pirates of the Carribean theme music suddenly arises from an off-cam person, or maybe it’s that Karlsson tried to go along with it. It doesn’t help that the rest of the video is spent in painful silence as the two walk down the dressing room hallway. Either way, it’s still pretty awesome. And there is something about Karlsson that resembles our favourite movie pirate – Captain Jack Sparrow.